Bottled water is the second most commonly purchased beverage in the United States. 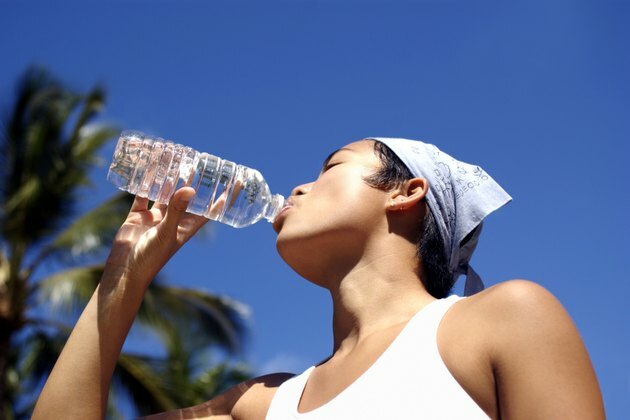 The Food and Drug Administration estimates that the average person drinks 26 gallons of bottled water per year. Bottled water carries many labels, from spring, drinking and purified to artisan and mineral water. The issue is not the type of bottle you choose but whether or not it offers any health benefits. While the FDA regulates the safety of bottled water, there is no scientific evidence to show it's healthier than tap water. Consumers like bottled water because it is widely accessible in all grocers, and it's easy to carry. Instead of taking the time and energy to fill up a reusable bottle of water throughout the day, packaged bottled water provides the ease of access to water anywhere, anytime. For some, having access to bottled water increases total daily water consumption. The key from a nutritional standpoint is to consistently choose bottled water over other accessible, portable beverages, such as bottles of soda or sugary tea. Some consumers prefer the taste of bottled water over tap. Furthermore, some brands use flavoring agents to enhance the water. Many of these products offer fruity and tropical flavors that are enticing to people looking to switch from soda to water. Not all flavored bottled water is necessarily calorie-free, however. Some flavoring agents can be made from sugar. To determine whether water contains sugar or calories, read the ingredients list on product packaging. Flavored bottled water is regulated by the FDA for health purposes. Aside from flavor, some bottled water brands also add nutrients to their products. Electrolytes, such as potassium and sodium, are among the most commonly added nutrients to water. Some brands also add B vitamins and vitamin E. Drinking electrolyte-containing bottled water may be beneficial after a hard workout, particularly for prolonged exercise. Also called sports drinks, such bottled water can be beneficial in helping your body replenish electrolytes -- minerals your body loses through perspiration -- but the American College of Sports Medicine cautions that each beverage should not contain more than an 8-percent carbohydrate concentration. This helps to stabilize blood glucose levels. Water itself is not only beneficial to your health but necessary for life. But there is a lot of hype behind the bottled water industry, which leads many consumers to believe that bottled water is somehow healthier than tap water. The bottom line is that water is important no matter what its source, as long as it's clean and safe. According to the Centers for Disease Control and Prevention, bottled water isn't immune to contamination. Such exposure can lead to illnesses of the digestive tract, as well as infections, neurological disorders and reproductive issues.